CFCF 2009 – the gang! Plans are already in the works for next year and we’re moving forward with the event plans for other locations around the country. If you are interested in attending a future event, please email cabinfeverclayfestival@yahoo.com to be certain your name is added to the list. We hope to see you soon! … Stay tuned for more! WOW!! CFCF 2009 a Huge success! Yes, it’s true and I can’t believe it’s over already. In addition to the incredible instructors we had, there were also some very creative attendees. Friendships were renewed and new friendships built…what an adventure we were on. The instructor demos were just as instructive as the workshops…looking forward to getting some photos to you. More to come. 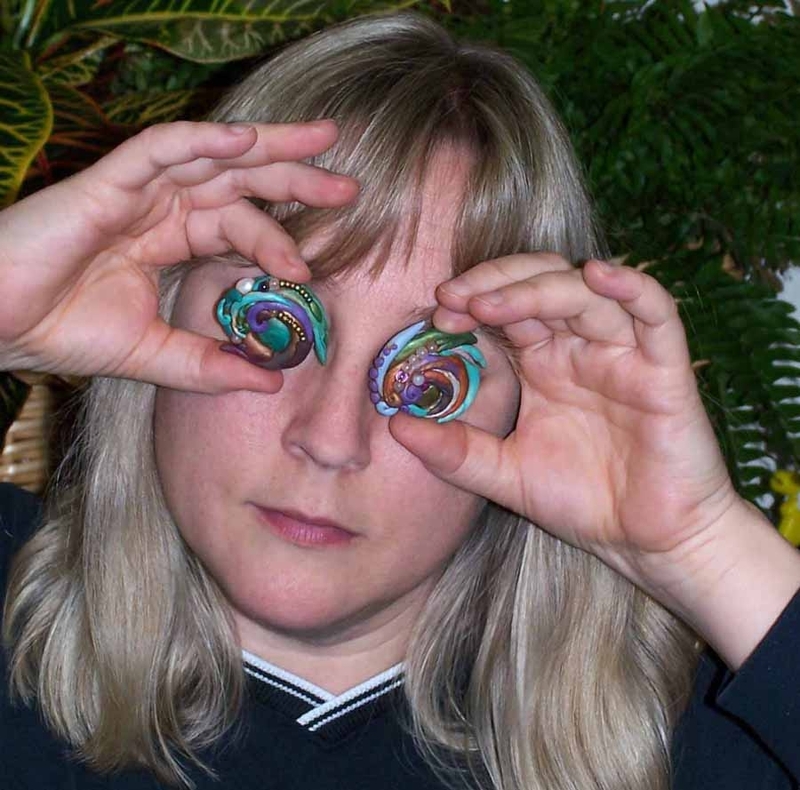 Lisa is an award-winning polymer clay artist, author, and designer. While I’ve not had the pleasure of taking a workshop from Lisa, her creative spirit can be seen in many of the arts and crafts media. She’s been a regular guest on crafting shows and is a frequent contributor to numerous magazines and a regular columnist for Polymer Cafe. 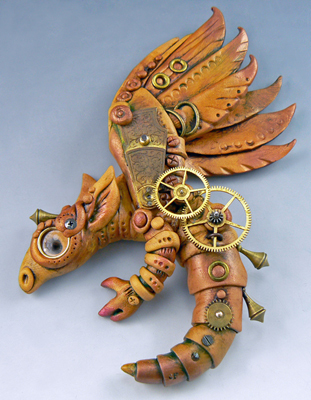 She has worked professionally with polymer clay and other media for over 20 years and teaches internationally. Lisa has developed her own lines of buttons and crafting and clay products and is a certified Art Clay Silver instructor. On the personal side, she is the mother of four grown children, and lives in Las Vegas, Nevada with her husband and two dogs. She’s a chocoholic, has worked in film including a stint as Julia Robert’s photo double, and loves all things involving tea culture. Join us for your opportunity to learn from Lisa at Cabin Fever Clay Fest! CFCF 2009 … Christi Friesen …definitely an original! Christi has been in Maryland to teach several times before as well…and she is always a hoot! Lots of fun and tons of energy. She definitely LOVES what she is doing. She’s been traveling a lot recently, so I pulled the following from her website to give you a bit more insight on her psyche. If you don’t have her books yet, you should definitely think about it…fun in every page. From her website: Christi Friesen was born at a very young age, kidnapped and raised by lemmings. She escaped to California where she got married, had various wonderful kids, and amassed credit card bills. She is currently considering having a midlife crisis, unless there’s something good on television. CF works in mixed media, combining polymer clay, glass, acrylic, found objects, gemstones and semi-precious stones, glass beads, pearls, precious metals, and pigments to make her unique sculptures and art jewelry. Her preference for polymer as her sculpting medium is a result of the versatility, durability, and unparalleled ease with which it can accommodate gems, pearls and stones. These are worked into the sculpture while the clay is uncured, thus allowing for a very organic design in which the stones are an integrated into the design. 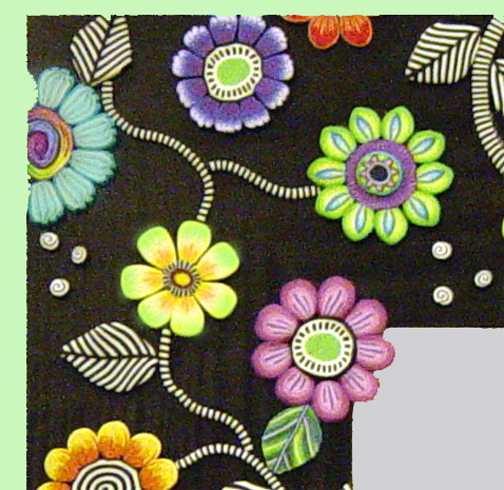 The medium is also colorfast and lightweight. CF is an artist because she must be. Her goal is to amuse herself, and if others are also amused, so much the better. All her pieces are one-of-a-kind and although she may make pieces that are similar in theme or subject, no two will ever be alike. Where would the fun be in that? She is happy to consider commissioned work if the project interests her. CF’s work is available at galleries and juried fine craft shows. She is a contributor to magazines and books. More of her pieces can also be found at www.CFOriginals.com. 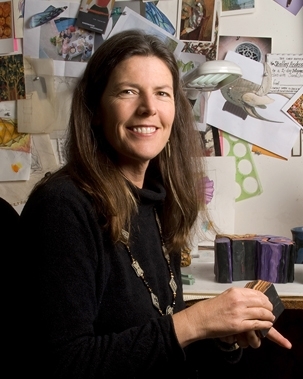 She is an accomplished polymer clay artist and teacher who graduated from the University of California at Davis in 1983 with a bachelor’s degree in art. In 1986 she was employed in a fabric and art supply store in San Francisco where she first began working with polymer clay. 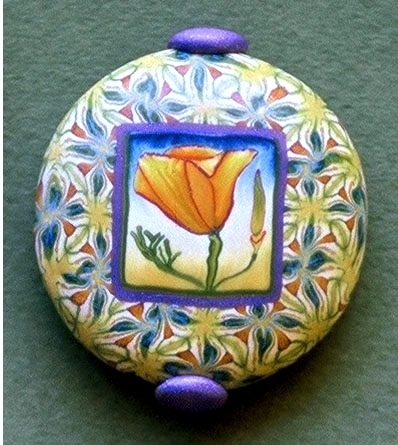 Since 1989 she has been working full time out of her home/studio in San Rafael using the mille fiori, or caning technique to make intricately patterned beads, buttons, and jewelry. Her background in textiles is evident in her designs, which were described in an Ornament Magazine review as “meticulous, delicate, and elegant”. Sarah has been recognized as a pioneer and master of her craft and has participated in a number of juried and invitational exhibits and shows. 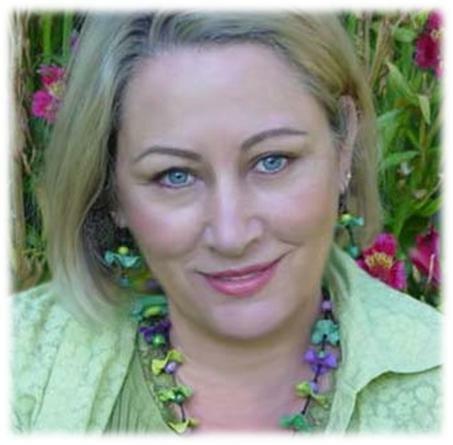 She loves to teach and has taught all over nationally in the U.S. and internationally including Israel, France, and other European countries. Her work can be seen at www.sarahshriver.com. If you’d like to join Sarah at CFCF 2009, click on the “Mardi Gras Mania” tab at the top of this page. CFCF 2009 – Meet Kim Korringa!